The CL-415 or Bombardier 415 is a Canadian amphibious aircraft designed to be used as water bomber. 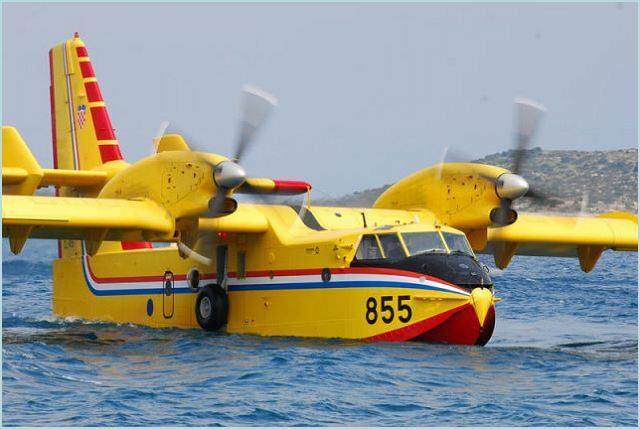 The the Bombardier CL-415 amphibious aircraft is the backbone of firefighting missions around the globe. 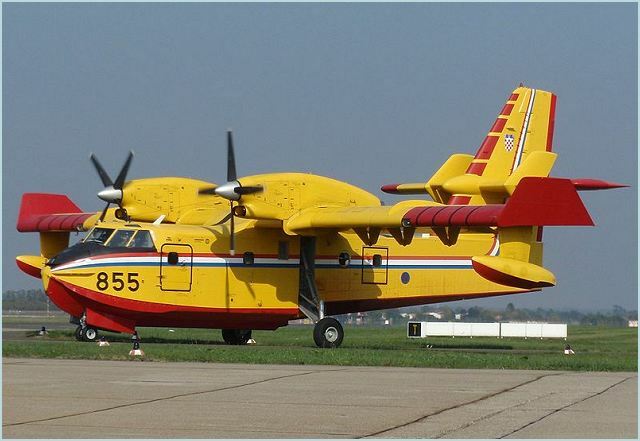 Launched in 1994, this high-wing, all-metal amphibian remains the only aircraft specifically designed for aerial firefighting. Its proven technology and fire-extinguishing power make it the most effective machine for the job. 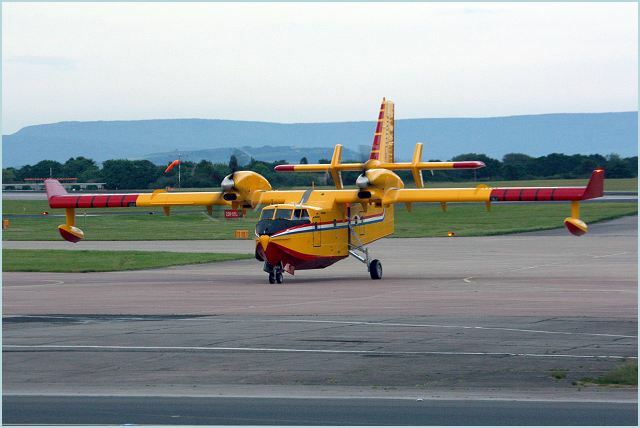 The 415 first flew on December 6, 1993, with the first deliveries in November 1994. Orders from several countries soon followed. 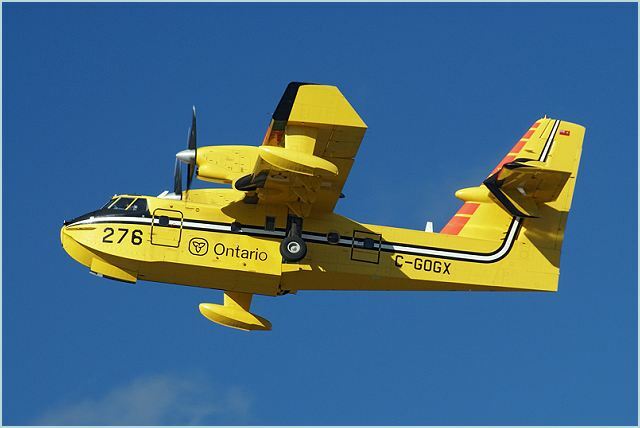 Derived from its predecessor's nickname, it acquired the name, "Super Scooper" in light of its greatly enhanced performance as a water bomber and fire suppresser. 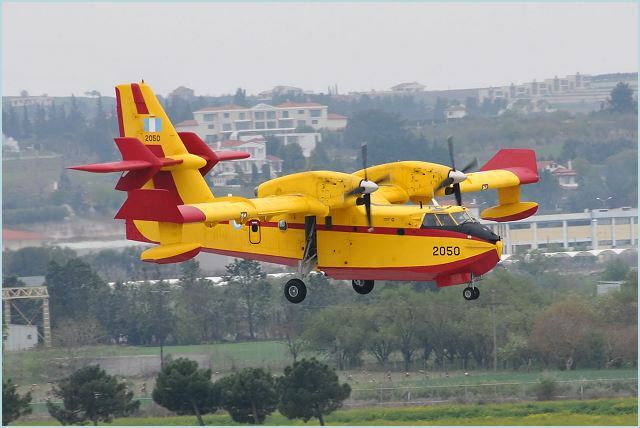 - 415MP: Multipurpose version incorporating FLIR, SLAR and nose-mounted search radar for missions such as search and rescue, coastal and border patrol and environmental monitoring, while the aircraft retains the firefighting capability. 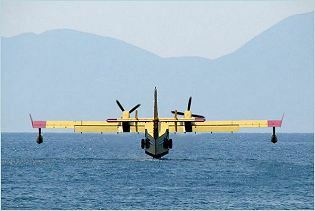 First flight (C-GHVX, the 55th aircraft, destined for Greece) 6 March 2002, preceding a 200-hour flight test programme, and the aircraft was delivered in late March 2004. 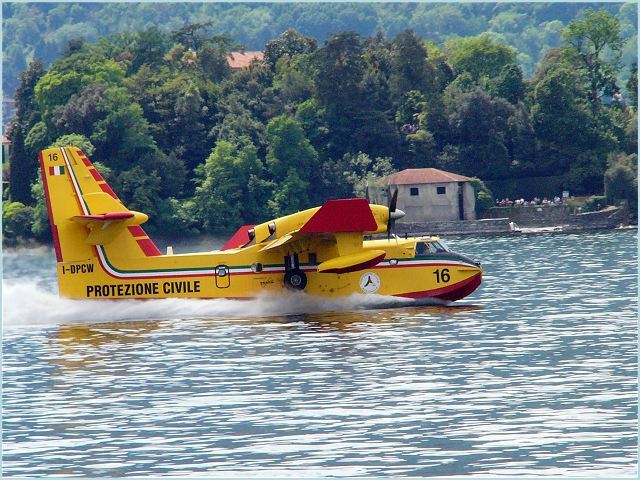 The 415MP can be modified for maritime, SAR and special missions. - 415 GR: Ordered by Greece, January 1999. It is based on the 415MP. It has increased weights and boat handling and cargo hoisting provisions. Two (plus an optional third) will be configured for C-SAR role, for which, during 2000, Saab was awarded a three-year contract to install MSS 5000 mission equipment including SLAR (each side), wing-mounted FLIR Systems SeaFLIR, nose-mounted Primus WX 660 weather/search radar, digital cameras, autopilot and provision for Have Quick secure radios and rescue beacon receivers. 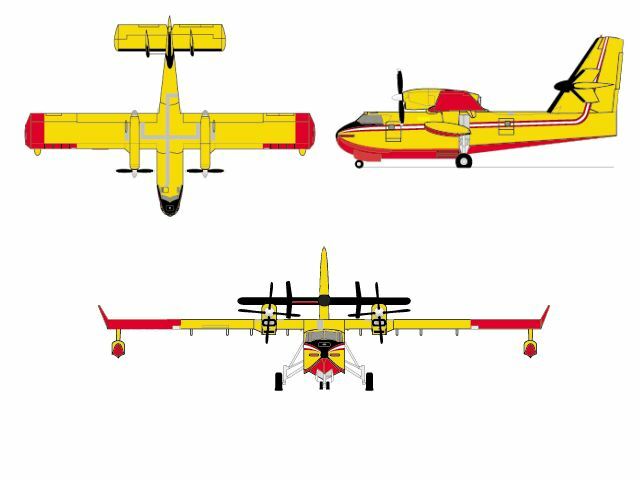 The aircraft will also have an enlarged cargo door to facilitate deployment of an inflatable rescue boat. 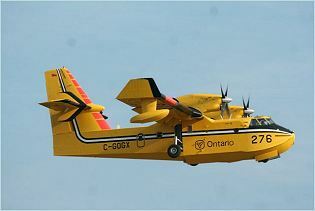 The Bombardier 415 (CL-415) is an high-wing, all-metal amphibian which was designed especially for aerial firefighting. This aircraft has a single-step hull, and fixed stabilizing floats are mounted just inboard of the wingtips. 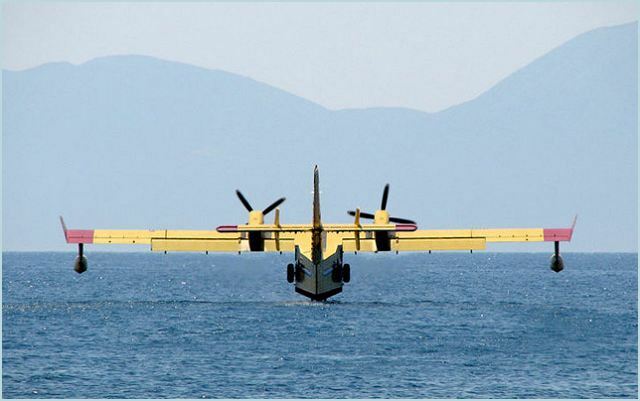 The tricycle landing gear comprises a twin nosewheel and single mainwheels, the former retracting into the hull and the latter being raised to lie flat against the hull during operations from water. The high-mounted wing and tailplane are single-piece structures, with ailerons and flaps occupying the entire wing trailing edge. All fuel is carried in flexible wing cells, and the engine nacelles are integral with the wing structure. The normal crew of two sit side by side on the flight deck, with dual controls. There is an additional station in the maritime patrol/SAR versions for a third cockpit member, a mission specialist and two observers. The Combi layout offers cargo at the front, full firefighting capability, plus 11 seats in the rear. Other quick-change interiors are available for utility/paratroop (up to 14 troop-type folding canvas seats in the cabin) or other special missions according to the customer's requirements. 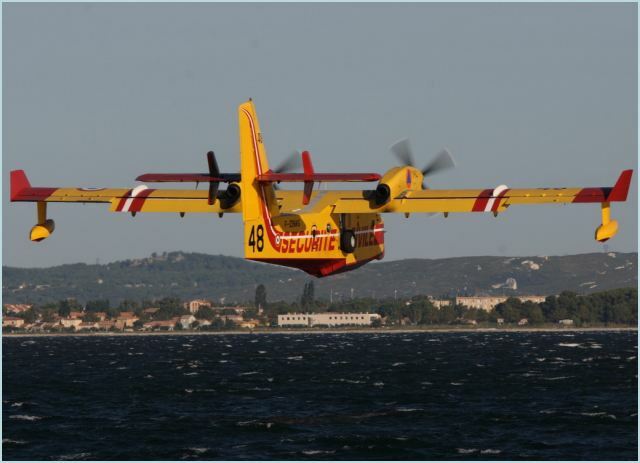 The CL-415 or Bombardier 415 instrumentation and navigation equipment include Honeywell Primus 2, Radio Navigation, RNZ-850 with ADF, VOR/ILS/Marker Beacon and DME, Litef/Honeywell LCR93, Attitude and Heading Reference System Honeywell EDZ-605 EFIS with Dual EADI and EHSI, Radio Altimeter (Honeywell AA-300), Parker-Gull Three-tube Active Matrix LCD Integrated Instrument Display System, Dual CIC/Aerosonics Air Data Computers and Dorne & Margolin ELT-8 Emergency Beacon. The Bombardier 415 (CL-415) is powered by two 1,775 kW (2,380 shp) Pratt & Whitney Canada PW123AF turboprops, on damage-tolerant mounts capable of withstanding a breach of the compressor/turbine casing, each driving a Hamilton Sundstrand 14SF-19 four-blade constant-speed fully feathering reversible-pitch propeller. Two fuel tanks, each of eight identical flexible cells, in the wing spar box, with a total usable capacity of 5,796 litres. Fuelling is done by Single-point pressure refuelling (rear fuselage, starboard side), plus gravity fuelling points in the wing upper surface. Known as the Superscooper in United States, this world-renowned firefighter adapts to the roughest terrain. 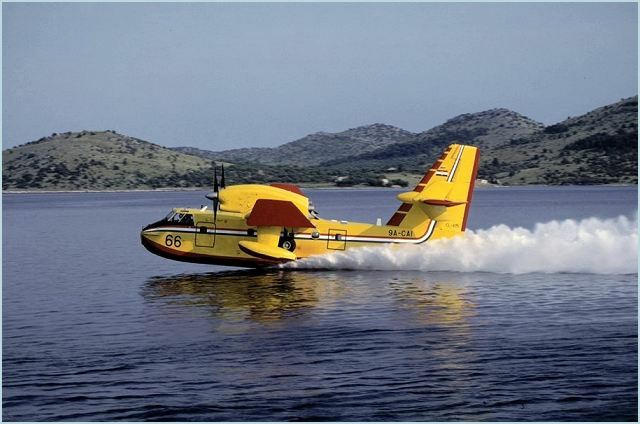 It lands on unpaved runways, lakes, rivers and seas, enabling both rapid initial attacks to extinguish fires and sustained attacks to contain fires. 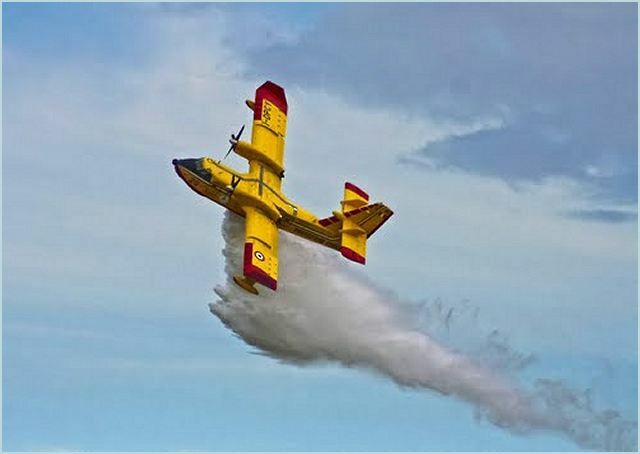 The Bombardier 415 aircraft takes only 12 seconds to scoop its 6,137-litre (1,621-US-gallon) load while skimming at high speed over water. It delivers repeated direct attacks, with foam suppressant added to its load, without returning to an airfield. Simple to operate and maintain, the Bombardier 415 aircraft requires a minimal crew of two pilots. One technician can easily maintain an aircraft from a remote base for several days. France, Canada, Italy, Croatia, Greece, Malaysia, Spain, United States.